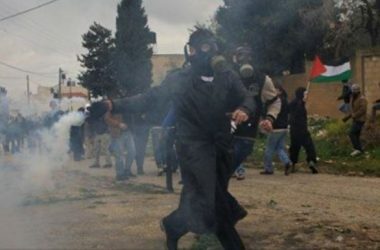 Israeli soldiers invaded, on Wednesday at dawn, Kufur Qaddoum town, east of the northern West Bank city of Qalqilia, stormed and searched homes, and fired many gas bombs at Palestinian protesters, causing many to suffer the effects of teargas inhalation. The invasion was carried out by several armored military jeeps, before the soldiers stormed and violently searched many homes. The soldiers caused anxiety attacks among many children, after invading and ransacking their families’ homes. Furthermore, the army fire gas bombs and concussion grenades at local youngsters, protesting the invasion, causing many to suffer the effects of teargas inhalation.